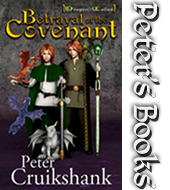 This is an engaging medieval fantasy novel well worth your time. 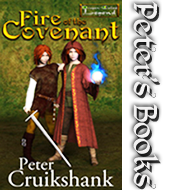 “Fire of the Covenant” manages to go in unexpected directions while still hitting all the expected fantasy elements from wizards and dwarfs and dragons to expert swordsmen and charming ladies. There are four major protagonists, and each has an interesting role to play, an aspect which feels fresh to me. Scene to scene, there is always something to keep you moving forward into the story, always a reason to turn the page. I stayed involved in the story and in its world, and look forward to reading the next books in the series as they become available. OK, I can do the normal thing and speak about character development, great writing, great story, but I’m not. What my review comes down to is this – I finished the book and was left wanting the the story to continue! I can’t wait for the next book. Actually I really need the second book!